Put a few cloves of the fresh garlic to good use last night. The penne was tossed with a fresh tomato sauce seasoned with lots of garlic and fresh basil. The prawns were rubbed with a lemon parmesan pesto and grilled. I tossed a few balls of mini boccochini cheese (fresh mozzarella) into the hot pasta before adding the room temperature tomato mixture. The heat from the pasta slightly melted the cheese. Moe moaned as he ate his dinner. Really, my family will love this; we love pasta and shrimp together, so with your additions it has to be great! Ann, every time I see those prawns in one of your dishes, I get so jealous! I would love to be able to taste them just once - they always look so sweet and succulent. Yum! 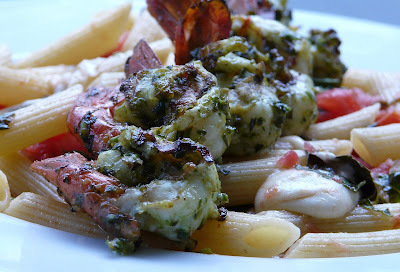 Looking at all that cheesy goodness with basil and prawns.... oh yes, I moan just looking at your delicious picture! Ann, this looks so good ~ I could eat it for breakfast! You captured it beautifully, too. Very nice.